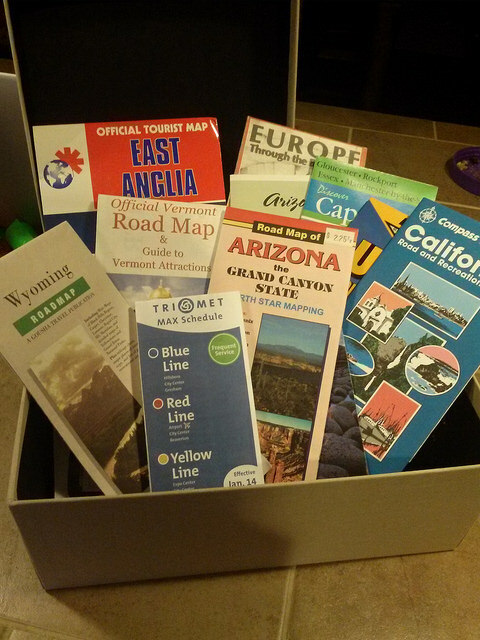 In anticipation of our impending road-trip I have been pulling up my rough itinerary on google maps, getting out the map box and checking to see if I have the maps I want to take and also plugged a few of the stops I know we want to make into the navigation on my phone. All of this is getting me so excited to hit the road, wondering about the new things I will get to see and do, salivating about the food I will be eating and makes me thing about wanting to try something new. Paddle boarding I think this time! I love my maps too, because if there is anything I am, I am a planner. I love to plan trips, moves, purchases, events, parties, how to get something done ~ I love to plan. Sometimes I fear I love the planning part more than the actual event part, but I hope that is only marginally true. I love my maps for the memories that they bring back to me; they are just as important to me as the pictures I take or the journal entries I make and sometimes trigger memories better than anything else. But I also love techie stuff too and one of the favorite phone apps I discovered on our last road trip was called Field Trip. It used your GPS on your phone to tell you about interesting things nearby and lets you customize what types of things it tells you about; like if you are interested in Historic Places and Events or looking for Zagat rated dining you can use a filter it to tell you about those things and not the amusement parks or museums or vis-a-versa if amusement parks and museums are your thing. Pretty cool. My husband tends to be the driver and I am the navigator, we have become a pretty good team over the years, finding interesting places on purpose and well, yes, sometimes by accident. My favorite drives have been the ones on both coasts; California along highway 1 and in the Northeast from Boston to Cape Ann with breathtaking sunsets in the west and a beautiful reason to rise early and meet the sun in the east. Here’s to a week of fun, adventure and beautiful sunsets! Do you have a favorite travel tool ~ high-tech or low-tech that you use?